Prospect Alexander Radulov recorded a goal and two assists against Columbus Thursday. Ramzi Abid scored a hat trick and five other Predators found the back of the net as Nashville made a trip to Memphis Thursday night and came away with a 8-1 exhibition win. Center Scott Nichol posted three assists in the game and prospect Alexander Radulov added one goal and two helpers. Shane Endicott and Martin Erat also notched multi-point games, contributing two assists each. Nashville jumped out to a 4-0 first period lead and allowed only a second-period power-play goal en route to the victory. Goaltender Tomas Vokoun, who played the whole 60 minutes, allowed just one goal on 23 shots to earn the win. The game started with fireworks in the first minute. Columbus winger Jody Shelley collided with Vokoun, prompting reactions from Shea Weber and Darcy Hordichuk. Shelley and Hordichuk broke into a brief bout of fisticuffs and when the dust had cleared, Shelley was tagged with a minor for goaltender interference, a minor for instigating a fight, a major for fighting and a 10-minute misconduct. 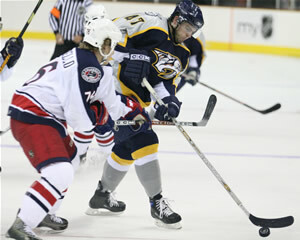 Hordichuk received only a five-minute major for fighting, setting up a four-minute power play for Nashville. The Predators' initial opportunity with the manpower advantage got off to a slow start thanks to aggressive penalty killing by the Blue Jackets, but once Nashville dented Columbus goaltender Frederik Norrena, the ball started rolling. With only seconds remaining on Shelley's first minor, Shane Endicott won a face-off in the Jackets' zone and sent the puck back to defenseman Mikko Lehtonen. Lehtonen, who proved with six shots in Sunday's preseason opener that he's not afraid to tee it up, skated a few strides toward the center of the ice and blasted a shot that beat Norrena cleanly to his right at 2:23. Just over two minutes later--and seconds after Columbus' penalty time expired--forward Ramzi Abid took a pass from Scott Nichol on a rush and fired the puck by Norrena. The goal, which came at 4:26, put Nashville up 2-0 and put Columbus on its heels. The line of Radulov, Erat, and Rich Peverley struck only 54 seconds later. Erat carried the puck down the right wing, protecting it as he angled in toward the net. His shot on Norrena was turned aside, but Erat smartly kept the puck alive with a centering flick as it trickled toward the end boards. As the puck bounded back across the crease, Radulov got a stick on it before Peverley forked it in at the left post to make it 3-0. Nashville increased the lead to 4-0 at 7:14, when J.P. Dumont found Kimmo Timonen streaking in from the right point. Timonen's backhander beat Norrena high. As the opening period drew to a close, Nashville generated another close chance when Erat's shot from the right circle was deflected just wide by Peverley. The blistering scoring pace slowed and the penalties increased in the second period. Moments after Norrena was swapped for goalie Tomas Popperle at the game's midpoint, Nashville made it 5-0 with its second power-play goal of the night. Radulov capped off a tic-tac-toe passing play that went from defenseman Marek Zidlicky at the right point to Erat near the base of the left face-off circle. Erat's cross-crease delivery found Radulov at an incredibly sharp angle to the right of the goal, but the gifted prospect had no trouble depositing the puck. Penalties to Predators Greg Zanon and Pat Leahy put Columbus on a five-on-three power-play for a full minute, but Columbus was unable to capitalize until after Zanon left the box. With the teams skating five-on-four, Anders Eriksson's left-point drive hit either Vokoun or the goal post and rifled right back out into the slot. Alexandre Picard jumped on the rebound and put it to the right of Vokoun. The power-play goal put Columbus on the scoreboard at 14:16. In the final minutes of the middle period, each team came close to adding to its total. Vokoun made a sharp save on a point shot by Aaron Johnson and at the other end, Popperle made a pair of tough stops on Endicott and Peverley. Those back-to-back Preds' scoring chances were initiated by a thread-the-needle pass from Dumont to Endicott as he emerged from the penalty box behind the Columbus defense. Tempers, which had been flaring since Shelley's initial bump of Vokoun, boiled over in the third. Jerred Smithson and Ole-Kristian Tollefsen squared off 1:50 into the final frame. After Nashville added two more goals to make it 7-1, Weber and Tollefsen went toe-to-toe at 10:36. Other confrontations resulted in matching unsportsmanlike conduct penalties for Jordin Tootoo and Jason Chimera and 10-minute misconducts for Erat and Picard. Weber and Hordichuk, who rushed to Vokoun's defense early in the game, combined for Nashville's sixth goal. Weber's left-point shot was tipped in front by Hordichuk at 6:25 of the third. Moments later, Abid scored his second of the night when he received the puck to the right of the Jackets' net, stepped out into the slot and picked a spot on Popperle. Dumont, who had a very strong game, tried to set the table for Nichol at the left post but Nichol's bid went wide. Then Abid was rewarded for being in the right place at the right time, when a fluky goal resulted in his hat trick. At 15:35, a clearing pass by a Columbus defenseman ricocheted off Abid's shin pad and past a surprised Popperle to make it 8-1 in favor of Nashville. Popperle made a goal-line save with one minute remaining to limit the final scoreboard deficit to seven. The Predators returned to Nashville late Thursday and will practice as one group at 10:15 on Friday morning. That afternoon, team members will travel to Raleigh, N.C. to battle the Hurricanes in a 6:00 p.m. CT match-up. The Preds and 'Canes will rendezvous again Saturday night in Nashville at the Gaylord Entertainment Center.